Ms. Ozaki is one I was acquainted with in the last Japan Expo in Paris. At the time she set up a booth named “Dream of Sanuki 2008” and sold half cooked Sanuki Udon (wheat noodle), Ajiseki stone a special product of Kagawa Prefecture, japanwares, handmade Japanese paper, mizuhiki, kites, traditional art works as calligraphy and works of artists. (On a big screen in the site a film “UDON” was presented first time in Europe.). It was at a Udon shop in Paris, she dropped in as a French language trainee, that she had an idea to set up an Udon booth in Japan Expo. Seeing people standing in a queue for udon for 1400 yen a bowl she strongly resolved to present a genuine Sanuki Udon on the occasion. However, in order to realize that idea it will cost several million yen including the travel expense. With no money, nor connection she kicked of from zero. Many people, however, cheer her up, admiring her planning and enthusiasm, saying “I will help you when you will be in a pinch.” but few people have actually fund her. Rejection, however, made her work harder. She talked to everybody about her dream of Sanuki, mailed to distant acquaintances and wrote essays on news papers. Besides, Fuji TV, the holder of copyright of the film UDON, permitted her present it at rock-bottom price. And she went to France with two volunteers carrying 200 kg of specialty products and art works of Kagawa Prefecture to booths in the site. The Japanese Embassy in France registered the “Dream of Sanuki 2008 in Paris” as a memorial project of Japan-France 200th anniversary, and invited it to the eve party of Japan Expo in the embassy residence. 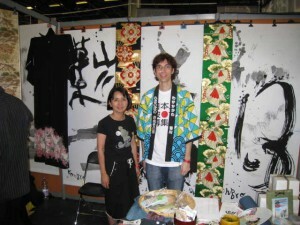 attracted visitors, for there was no other booth exhibiting and vending Japanese art works. A really required thing is not money, but an adamant enthusiasm and the network which supports it, that’s all. Her words are so heavy because nobody but those who accomplished something can utter. Day by day it is getting more peculiar the autumn colors of Maruyama Castle comfortable to my eyes. Thank you for all your trouble. Let us keep our emotional ties! By the way, I am going to apply to the Tourism Ministry for a subsidy as a cooperating body with its “Yokoso Japan” campaign, and planning a tourist questionnaire on the site. And I will rent a booth and a stage there, and will prepare some sales incentive. How do you think about it. I would be very glad if you give me an advice. Power of Ms. Ozaki shows no sign of weakening. She will appear in Paris, with many cooperation and backings also in the coming year. “Dream of Sanuku 2009 in Paris” is already beginning.